This is the most recent information about Ricky Nelson that has been submitted to amIright. If we have more information about Ricky Nelson, then we provide a link to the section where it appears (the actual page whenever possible). "Hell Mary Lou" originally "Hello Mary Lou"
Now his greeting to Mary Lou is more stern. "Young Wold" originally "Young World"
"Young Word" originally "Young World"
"Believe Hat You Say" originally "Believe What You Say"
"Mighty Goo" originally "Mighty Good"
"Hello Marry Lou" originally "Hello Mary Lou"
"Hello Marcy Lou" originally "Hello Mary Lou"
"Hello Marty Lou" originally "Hello Mary Lou"
"Gardena Party" originally "Garden Party"
"Believe What You Stay" originally "Believe What You Say"
"Sweeter Than Lou" originally "Sweeter Than You"
"You Are The Only Ode" originally "You Are The Only One"
"You Are The Oily One" originally "You Are The Only One"
"You Ate The Only One" originally "You Are The Only One"
"You Are The Only Ore" originally "You Are The Only One"
I first heard this as a child then unfamiliar with any German words or places, so naturally I was hard-put to understand it. I made out the best hearing of it I could. I never heard the song again or consciously remembered it that I know of until well after I was grown up. Incidentally, in the meantime, when I first learned that there was a German language, I do remember having a vague notion at first that I might be spoken somewhere like Alabama or thereabouts. I always wondered where that notion came from, but didn't have a clue until I started doing karaoke and learned this song again, it being vaguely familiar from of old. I realized then the confusion between Berlin town and Birmingham just might have been the origin of my confusion about German being spoken in Alabama. Can't phone, (can't phone) we done spent ev'ry dime. Even if he did still have a dime, it wouldn't do him much good seeing as how pay phones cost more than that now. Then again, if the song were to be recorded today, he wouldn't be worried about pay phone money, but lack of a cell phone. "I Yell 'Sheer!'" originally "Shirley Lee"
"Sly Heir Lee" originally "Shirley Lee"
"He Is Yeller" originally "Shirley Lee"
"See Her Lily" originally "Shirley Lee"
"He Yells 'Ire!'" originally "Shirley Lee"
Makes my heart start to yearn. Berlin, Germany and Hong Kong, China are mentioned in these lines. 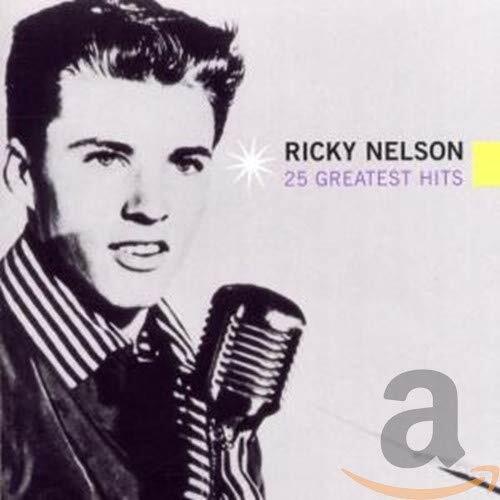 Nicky Relson originally "Ricky Nelson"